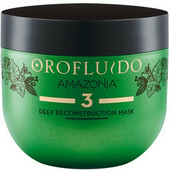 The Oil Rinse is the second step in the intensive feeding treatment of Amazonia. The entire treatment ensures that porous and damaged hair is restored where it is needed and will radiate again as never before. Use Step 1 of the treatment in advance! Apply to wet hair after step 1 and distribute evenly with a brush. Massage and foam. Rinse thoroughly.